It’s “birthday season” in my house right now. All 5 of us have birthdays within a 10 week period. So presents are a hot topic in our house right now. Have you ever considered that the gift of your presence might be exactly what your kids need? We live in a busy distracted world with endless “to-dos”. Before we know it, time quickly passes by and we find ourselves saying, “Where did the time go?” One of the dangers of parenting in this distracted world is that we will often forget the need to be present. What does it mean to give your child the gift of your presence? What does your time say about your priorities? Are your to-do’s crowding your time and stealing your attention from things that really matter? Turn off technology. Pause the chores. Remember that your perfectionistic list will never be finished. It’s ok to say no and wait in order to invest in giving your kids the gift of your presence. I’ve heard many clients describe their parents during their childhood as physically “there”, but not really there. As they reflect on how their parent wasn’t present, they often feel the pain of loneliness, abandonment, and loss about feeling like some emotional needs were not met in the way they needed. This isn’t to make you feel guilty, but it is important to know that your lack of presence can have a lasting impact on your kids. I know that life is crazy, but next time your child says “Mom look!”… pause, be present, and engage. You never know when they will give up caring if they get your attention. 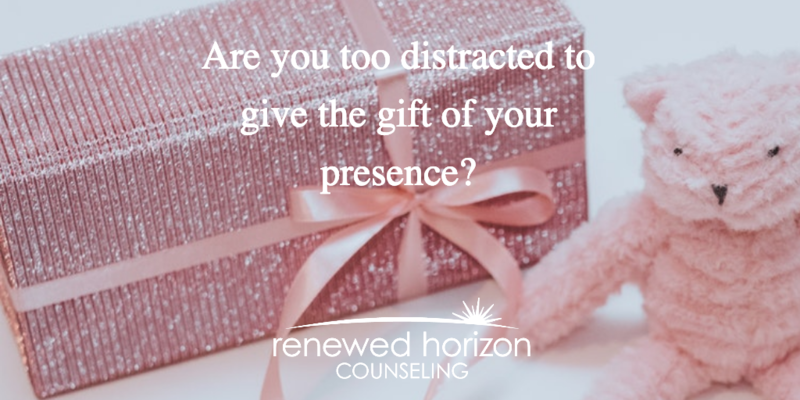 Giving the gift of your presence means you have to be intentionally engaged in the moment. Make eye contact. Ask questions. Show that you’re interested and care about what your child is doing. Every interaction teaches you about who your child is, what they like or don’t like, and how they think. Knowing them helps you love them well in the way they need to be loved. Hope these reminders keep you mindful of being present when life is overwhelming and distracting. Go love your kids by giving the gift of your presence today!